Both my parents are Austrian and I was born in the UK where I grew up and went to school. I joined the military rather young, before going to university. At that time, in the 80s, the British Government and the military ran various projects to find the leaders of the future and they took the top five per cent of all recruits within that year and put them on a special training programme. The programme ran for a year and a half, rather than the standard few months of basic training, to develop individuals from an educational, a physical fitness, and a leadership point of view. I went through this programme. I was part of a small group of people that were fast-tracked through the system thereafter because we were seen to be capable enough to be promoted quite quickly. The programme only lasted for a couple of years, but I was fortunate enough to be part of it. I did my special forces, commando, and paramilitary training. I was a diver and I learned how to fly helicopters and planes. Afterwards I moved into bomb disposal, starting off in normal explosives and incendiary devices and that moved into a niche area of nuclear, chemical and biological devices. Muscat: Le Beck, which has a presence in some of the Gulf Cooperation Council (GCC) countries, is planning to begin operation in the Sultanate in coming months, a top-level official said. 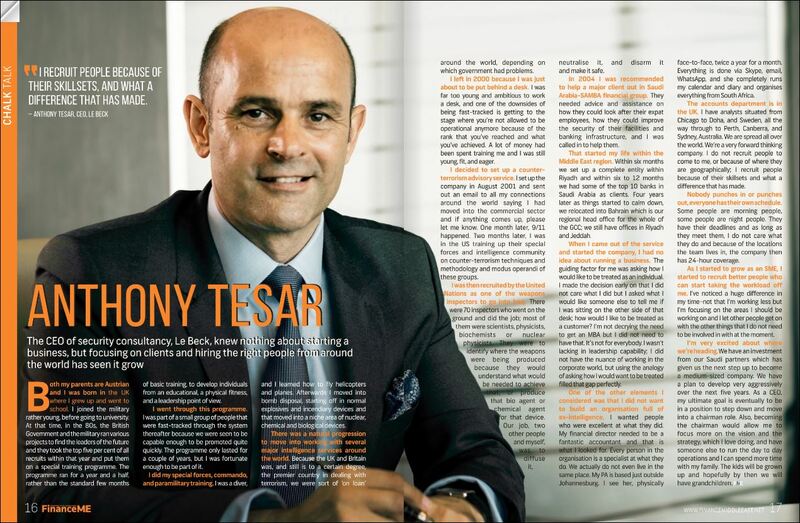 In an interview with the Times of Oman, Anthony Tesar, chief executive officer of Le Beck International security and risk management consultancy, highlighted the company’s future plans and its intended operations in Oman to enhance the already high standard of security prevalent in the country. But Miriam Eps, a regional security analyst at Le Beck, tells Newsweek that Saudi Arabia is willing to “look the other way” on this kind of rhetoric because of the opportunities Trump offers the kingdom. “[Gulf] governments are probably willing to compromise on this issue in the face of improved relations and preferred policies under Trump. In other words, if the cost of doing better business with Trump is paying some more for defense, I think they will consider this a very good deal,” she says. ©2019 Le Beck International Ltd.